Are Digital Devices to Blame For Your Joint Pain? The average adult spends 5.9 hours with digital media each day–a number which has skyrocketed in the past decade. When you consider this usage includes smartphones, desktops, laptops, and other connected devices like over-the-top streaming devices and game consoles, it’s a little surprising that the number isn’t higher. While they certainly come with added convenience, are digital devices doing more harm than good? Some research suggests that digital devices may be to blame for your chronic joint pain. Smartphones account for nearly two-thirds of a users total time spent on digital devices each day. All those hours texting and scrolling through social media from the convenience of a little portable, handheld device is doing a number on our hands and wrists. A recent study in Muscle & Nerve found that those who overuse small electronic devices are more likely to experience wrist and hand pain, as well as changes to a particular nerve in their hands. While a direct correlation to carpal tunnel syndrome hasn’t been proven just yet, researchers do think the overuse of small electronic devices can lead to an increased risk of developing CTS in the future. Medical researchers also believe that the rapidly increasing amount of time we spend on cell phones and other digital devices could result in a larger incidence of arthritis. While we’re not saying to give up all digital devices completely, we do suggest taking periodic tech breaks–especially if you start to notice aches and pains in your wrists, hands and fingers. Frequent use of digital devices can also lead to back and neck pain due to poor posture. To prevent hunching over your cell phone, computer or tablet, make sure you sit up straight with both feet planted firmly on the ground. Invest in a mount or stand to make sure your device is directly in front of you at eye level so that you don’t have to crane your neck downward while using them. If you need help remembering to take a break, set an alarm to get up from your desk no less than every hour. Use this time to stretch, go for a walk, or get a glass of water. The discs in your neck and back are mostly made of water, so hydration is key to keeping them pliable and strong. Don’t let chronic pain hold you back from your favorite activities. 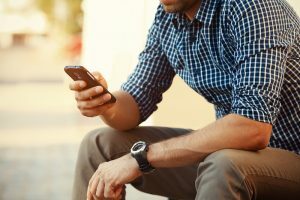 If you think you may be suffering from an overuse injury related to your digital device usage or otherwise, the physicians at South Shore Orthopedics can help. Call 781-337-5555 to schedule an appointment today.